Even if not a regular TV watcher, it’s hard to miss the immediately recognizable girl in the Progressive Insurance ads. Who knew this consummately capitalist concern is the baby of a Croesus-rich Marxist and Soros crony named Peter Lewis (deceased as of 2013)? This one, self-described as “half screwball, half businessman,” wrote big checks underwriting causes as varied but consistently far Left as MoveOn.org, legalizing pot and getting Glenn Beck fired. 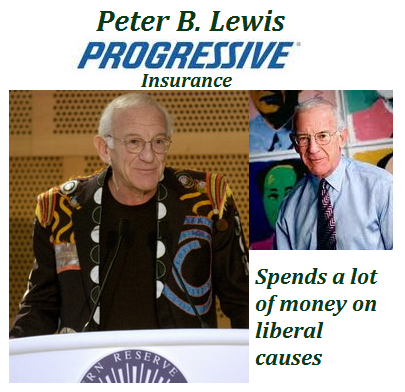 It’s certainly no accident why he chose the name Progressive. 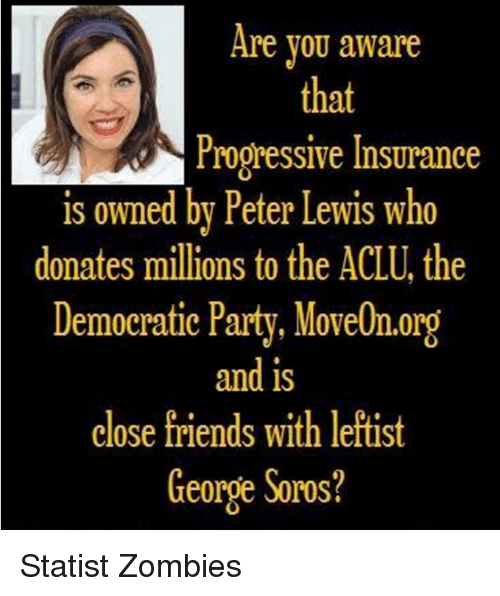 If a seemingly benign term suggesting compassion/love/progress can provide cover for a whole subversive political movement, why not an insurance company?! Caveat emptor! Another member of the self-congratulatory, Left-leaning Billionaire Giving Pledge Club (which not surprisingly does not include Donald Trump). With great fanfare give away millions (that are like pocket change for you) and force the Little People through Big Gov policies to fork out against their will. You look like a hero, and all the Ordinary Folks are forced to approach (but never quite reach) your level of virtue! That’s social consciousness! The two photos suggest a BoHo. In fashion, that’s a rich person who dresses expensively in the chicly impoverished style of Haight-Asbury, 1968. In politics, that’s a rich uber-capitalist who thinks like a Marxist. And has Warhol renditions of Chairman Mao (note photo on right) decorating his house. That was Peter Lewis.